Do you struggle with impostor syndrome? I do. Urban Armor Gear - Get details in the episode about how you can win an iPhone X case! 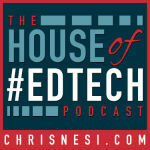 (11:00) House of #EdTech Recommendation - THREE awesome recommendations! (18:45) Featured Content - I explore some personal motivation and express a little frustration about my pursuit of more in education. This is a positive take.